The artistic and commemorative project "Upright Men" is part of a long reflection by the artist Bruce Clarke. This project comes from a request from the CNLG (National Commission for the Fight against Genocide) to produce work-related art forms of memory to be presented during the commemorative ceremonies of the genocide of the Tutsi in Rwanda in 1994. This project proposes the creation of a strong visual art work to mark the sites of massacres in Rwanda. 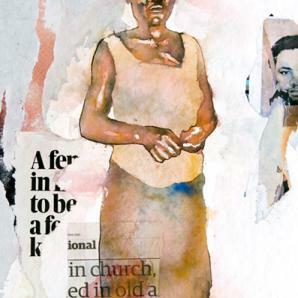 The principle is to represent in painted form, men women, and children on the outside of buildings, places of memory, and other sites of the 1994 massacres. The figures will be larger than life – often 15 to 20 feet high, silhouettes sketched but with a strong affirmed presence. They will be symbols of the dignity of human beings who went through the barbarous genocide. Victims or survivors, these upright men stand with dignity, testimonials to the painful history. The intention is to give a presence to the victims, restoring their individuality, reaffirming their status in the human community. The painted figures, every one different, will be emblems of the nobility of the men women and children engulfed by the violence, but who nevertheless, are still, from a spiritual point of view, upright and dignified. The sites of massacres themself will be marked by the symbolic presence so that no one can forget. These "Upright Men" will be emblematic images that could be painted in various sites throughout the world in the spring of 2014, for the ceremonies of the 20th commemoration of the genocide. The project has two distinct objectives and its realization two aspects. The first objective is to provide a strong and beautiful image to the people of Rwanda to mark the various massacre sites so that the history of these places is not forgotten, and to assert that the Rwandan people are still standing and dignified despite what they went through. The second aim is to give international visibility to the memory of the genocide of 1994. As part of the 20th commemoration ceremonies of the genocide in 2014, we hope that other symbolic places in the world will respond to the memory of April 1994 and cover their walls with "Upright Men". The international community, the powerful nations and the UN have a duty to honour the victims, to give humanity to the survivors and to remember their involvement in the events that led to the genocide in Rwanda. The aim is to bring to the forefront the history of genocide, to sensitize the world about the events of 1994, and recreate a bridge between the Rwandans and the international community. 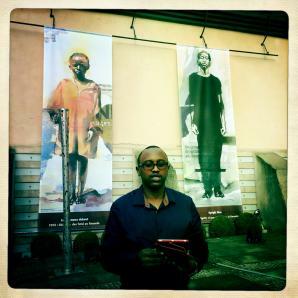 This project of public mural art will be executed, under the direction of Bruce Clarke and in cooperation with the Rwandan authorities and survivors associations, on sites linked to the memory of the genocide: such as public buildings where massacres occurred, particularly schools and churches. It is important to encourage an active involvement of Rwandan people in the creative process. For this reason, we will set up practical and theoretical workshops to train Rwandan artists and work in collaboration with them. Three techniques are possible to produce the "Upright Men": Mural painting, on the facades of buildings with a focus on the massacre sites in Rwanda thus perpetuating the memory of what took place in that place. Secondly, printing or painting on giant tarpaulins for temporary exhibitions and a wider circulation in various places (United Nations in New York or the Esplanade of Human Rights in Paris). Thirdly, there is the possibility of ephemeral yet dignified light projections of "Upright Men" during the nights of commemoration in Rwanda and elsewhere. The strength of this artistic work will come from the fact that it is reproduced in many sites. "Upright Men" embody the assertion of a people still standing, … They will say to those who pass by, that here, in this place, lived and died men, women and children, people who we will not forget.